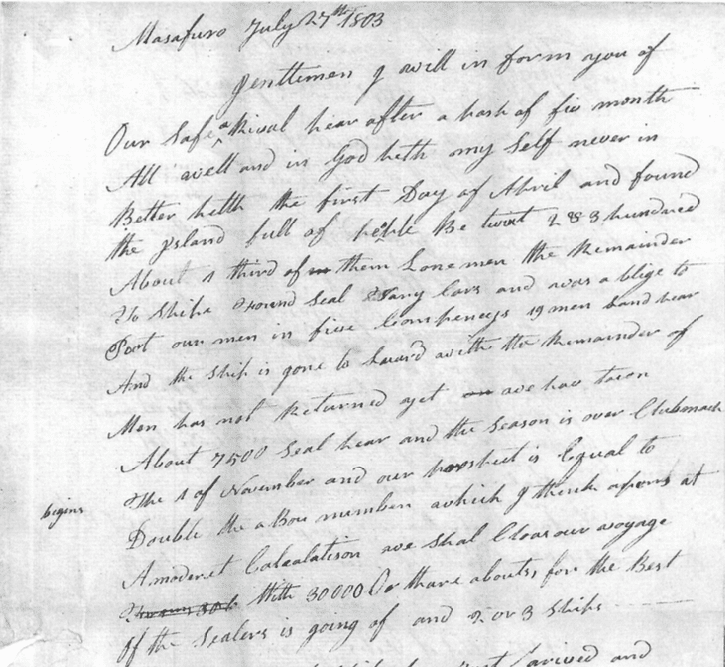 A letter by one of the ship's owners, John Winn, to the rest of the owners back in Salem, concerning the state of affairs while the Rachel was in Massafuero, an island off the west coast of South America. Click on the image below to view the full document in a new window. [Massafuero, or Isla mas Afuera (Farther Island), Chile, is now called Alexander Selkirk Island, after the the marooned sailor. It is the largest and most westerly island in the Juan Fernandez Archipelago of the Valparaiso Region of Chile]. Gentlemen, I will inform you of our safe arrival here after a [sail] of five months. All well and in God hath my self never in better health the first day of April and found the island full of people, between 2 and 3 hundred. About a third of them Lonemen, the remainder x around seal x y and was obliged to x our men in five x y z q. And the ship is gone to Land with the remainder of [the] men has not returned yet x y z. About 7500 Seal here and the season is over. x begins the 7 of November and our ? is equal to double the above number which I think ? at a modest calculation we shall clear our voyage. With 30,000 so have about for the best of the sealers is going of and 2 or 3 ships. The Newburyport ship has just arrived and landed 14 men, which makes our ? worse but in case they've sent any more I think our prospects equal to what ? ?? ships gone of with find voyages. But the greatest part is ?, But the island is done after this season is over. I don't think there be more than fifty thousand ? in a year after this and perhaps not twenty, for ? all of them of both kinds when we find them on the beach.